Just finished “No Way Back”, Andrew Gross’ new book. He manages to keep the excitement going throughout, as usual, while getting you personally invested in the characters, and I love how he manages to weave real-life events into his plots. Looking forward to the next one, Andrew! 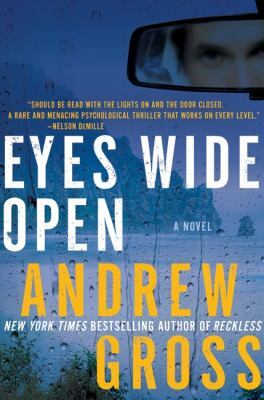 The unique thing about “Eyes Wide Open” (HarperCollins Publishers, 2011) is that it was inspired by a real life tragedy. In 2009, the author’s 25 year old nephew, Alex Gross, was found at the bottom of a cliff at Morrow Bay, having jumped or fallen to his death. Severely troubled, Alex had only days before been released from a hospital mental health ward in care of a small halfway facility from which he went for a walk, never to return. Was it suicide or something else? Andrew has taken this real-life and very personal happening and crafted a book which begins wth a fictional character suffering the same fate as Alex, and then proceeds to unravel the mystery of his death. It is also a story of two brothers, one successful and one wayward, trying to bridge the gap between them, while each revelation from the past puts them in more danger. Andrew has made this story exciting, thought-provoking, and also heart-wrenching, all the more so because of its link to real life, and it is well worth a read. An author who may never find the solution to his own real life mystery has perhaps achieved some sort of closure by inventing a fictionalized solution for his characters. Well done, Andrew. To read about Alex and the circumstances of his tragic death go to www.alexwemissyou.com.